A full room at the Waterloo Public Library for "'Whose War Was It, Anyway?' A Round-Table Discussion"
Not only are interpretations of war up for debate; the reasons behind how and why we remember it are too. On May 30th 2012 a packed Waterloo Public Library hosted a roundtable titled “Whose War Was It, Anyway?” Organized by the Active History Canadian Historical Association (CHA) Committee and supported by The History Education Network/Histoire et Éducation en Réseau (THEN/HiER) and the CHA, the event brought together a handful of historians to discuss not only various perspectives on the War of 1812, but also the meanings that lie behind the most recent moment of commemoration. ActiveHistory.ca is happy to feature a podcast of the roundtable. 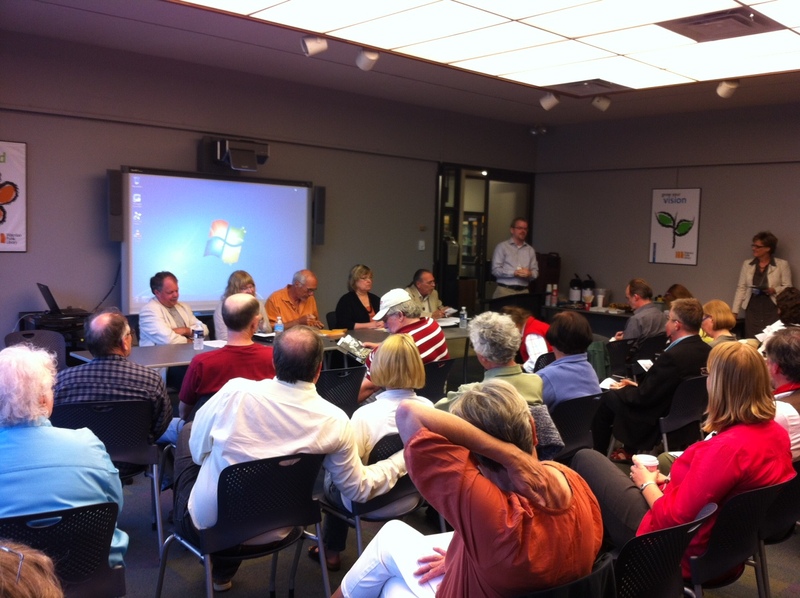 The roundtable concluded an engaging mini-conference on the War of 1812. The conference included presentations on topics such as augmented reality, the relationship between local tourism and the war’s commemoration, and the role of historic peace churches in Upper Canada during the conflict. Catherine Emerson, County Historian of Niagara County, New York, provided a lively perspective on the war from south of the border. She compared the actions of Laura Secord and her lesser-known American counterpart Betsy Doyle. “Politics aside, both women reached out of their traditional spheres to defend themselves, their families, their communities, and their country,” Emerson stated. Journalist Jamie Swift, co-author of Warrior Nation: Rebranding Canada in an Age of Anxiety (2012), argued that the commemoration of the war by the Conservative government is part of a larger attempt by “new warriors” – politicians, militarists, and even historians – to rebrand Canada as a nation of militarism. He questioned why the Conservatives were spending $28 million to commemorate “this senseless and bloody conflict” as they cut funding for Library and Archives Canada. Professor Esyllt Jones of the University of Manitoba noted that the recent People’s Citizenship Guide: A Response to Conservative Canada (2011), which she co-edited, excluded mention of the War of 1812, but she acknowledged this was only one way to deal with the meaning of the conflict. Keith Jamieson, Manager of the Six Nations Legacy Consortium, was the last speaker. He explained the process by which the Mohawk community recently engaged in dialogue about how they could remember the conflict. He underlined that the War of 1812 has never truly ended for the Six Nations. The discussion that followed once the short presentations concluded and the floor opened up is not included as part of the podcast, but was just as interesting. The room seemed divided. Some expressed happiness that the war – and therefore Canadian history – was being discussed and remembered at all. Others questioned why the federal government funded commemoration of this historical event, the War of 1812 (and not others), and what particular messages were promoted through its remembrance. One line of thought within this critical perspective believed the Conservative government had decided to invest millions for the war’s commemoration as a means by which to push a conception of national identity rooted in armed conflict and empire. Comments and questions during the discussion period reinforced the contentious, fractured meanings of the war and the wider process of commemoration. As a summer filled with 1812 commemorative events carries on, Canadians will continue to ask whose war it was. In doing so, they should also ask themselves: at whom is the contemporary commemorations aimed? Who belongs, and who is excluded? In other words, “whose war is it?” – and why? A special thanks to Active History CHA Committee coordinators Jessica Squires and Jamie Trepanier for organizing a very successful mini-conference.